How to run 2 Whatsapp in your Android without Root - Working Method !! How to run 2 Whatsapp in your Android without Root – Working Method !! Till now you have heard or seen OGwhatsapp or such other apps which lets you access 2 whatsapp in same Android phone but now they do not work. Since long time I was searching for effective trick to use two whatsapp account in one device and today I am here to present you two amazing tricks!! Yes!! 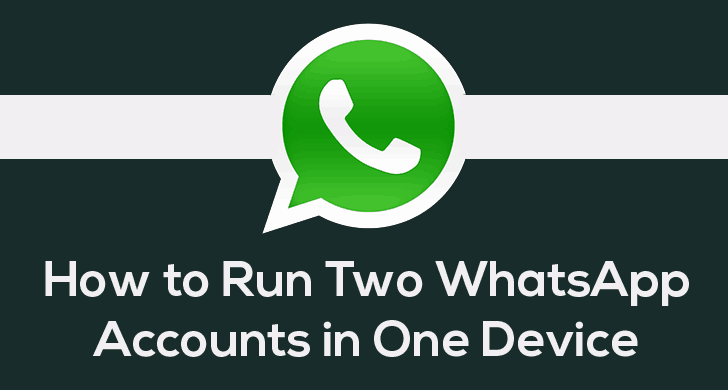 I have two ways to install two whatsapp account in one Android device without root. Both tricks are working well so its upon you which to apply. First Thing – This trick works only in lollipop version and not in lower than Lollipop. > In your Lollipop Android Phone, Open another user account from the top notification menu. > It will ask another Gmail ID to register another user in your Smartphone. > Proceed further and then you will have another user account. In that, open google play store and install Whatsapp. > Here you will have fresh whatsapp app where you can run another account easily. This method uses another app which is kind of similar to OGWhatsapp so you might get familiar very easily. Though earlier OGWhatsapp used to work amazingly but now you can’t. If you will try, it will show error as they stopped supporting newer versions so we came with interesting alternative to OGWhatsapp. You don’t need to Root! Install WhatsMapp which you downloaded from above link and Launch the application. Now Enter the WhatsApp Mobile Number which you are already using in your whatsapp installed in the same device. Now your WhatsMapp application have real whatsapp account. Now, Clear Data of Original Whatsapp from Settings>Apps options. Now Open Real Whatsapp application. It will prompt you to enter the mobile number, This time enter the new Mobile number which you want to run along with the old one and then verify that number and finished!! So finally you are running two whatsapp in your device. For any kind of help or query, comment below or contact us. Actually mera mobile no. mere Frnd me what’s app pe Blocked kr diya h.to mai use massege nii kr Santa.isliye plz mujhe koi trick bataiye taki mai us baatein kr saku.mera mtlb ye h ki mai kaiskaise apmobile mobile no. for se unblock kr lu uske what’s app se aur use pta v na chle.Jo no. Mera usne block kiya h wahi no. Ko mujhe unblock krke use for se massege krni h kyu ki mere pass dusra mobile no. Nii h.
Plz koi tarika dijiye ki mai apna mobile no.what’s what’sapp se unblock kr lu aur use malum v na chle. Right now there is no such trick which can unblock your mobile number in your friend’s whatsapp. You can try sending him/her message from another device. Can i use two number in one whatsapp. Now i can use 2 WhatsApp in my mobile. It’s working great with hide status features..
parth i had downloaded whatsmapp d day before yesterday but now itz showing u have 5days to upgrade this version nd when i clik on that itz show item is not found.. what can i do…how can i upgrade whatsmapp?pls help me..